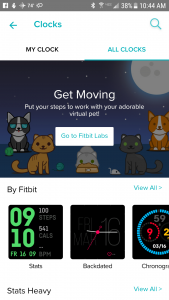 The Fibit Versa is Fitbit’s second smartwatch after the release of the Ionic. 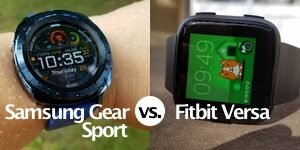 Both watches run Fitbit OS and are aiming to be contenders against the Apple Watch and Wear OS. 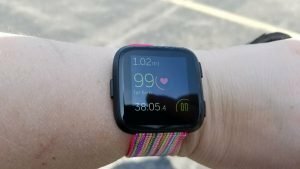 When I first saw the Versa I was happy with the design because it’s much more appealing than anything else Fitbit has come up with. My first couple weeks with the Versa was rocky road. 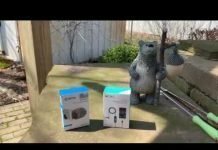 Bluetooth connectivity and syncing issues plagued my experienced. 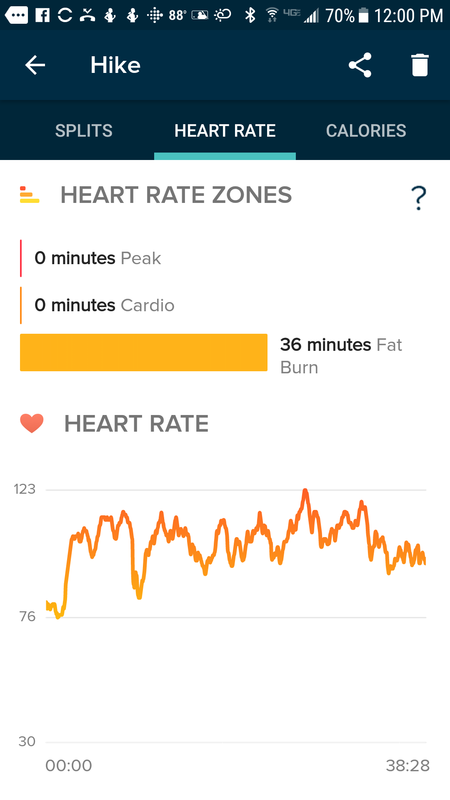 While the fitness tracking features tested very well from the get-go, except GPS activities due to Bluetooth being dropped so often, I tried everything thing I could think of to solve the connection issues and I think I finally found what the problem was and so far it’s fixed it for me. 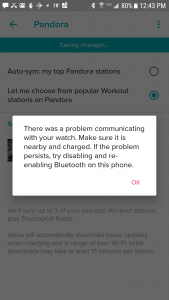 What worked for me was to remove every other Bluetooth device that I had paired with my phone (including the Versa) and make sure I also removed the Versa though the Fibit app as well. 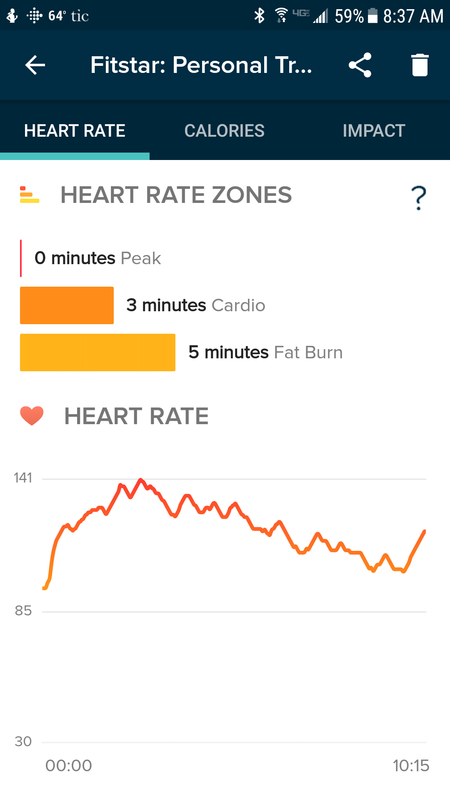 Adding the Versa back in the Fibit app seemed to have done the trick. 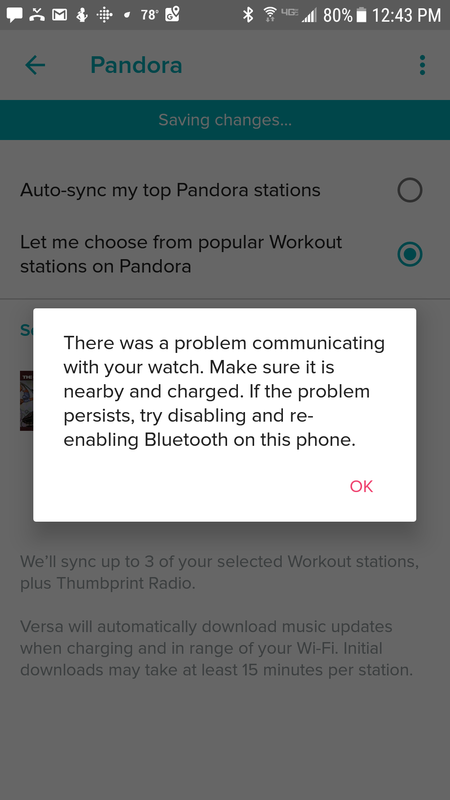 Fitbit does say to disconnect all your Bluetooth devices before setting up the Versa and I guess they weren’t kidding. Since then I haven’t had any connection issues. Woohoo! It’s been syncing regularly throughout the day and when I force it to. 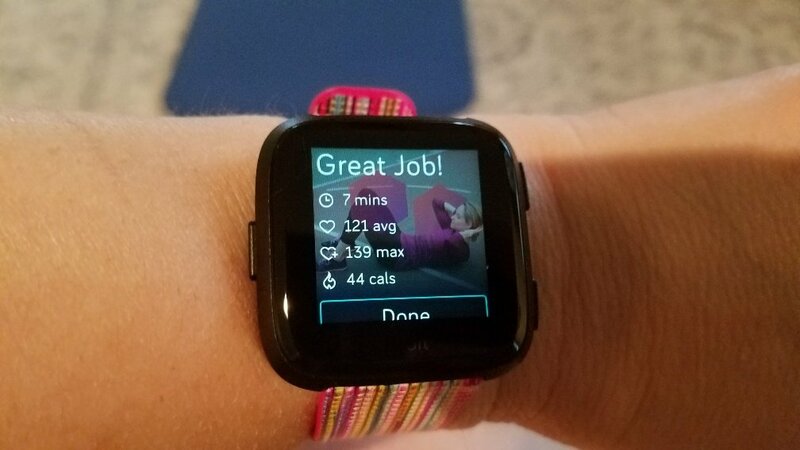 So, I can feel much more confident recommending the Fitbit Versa. 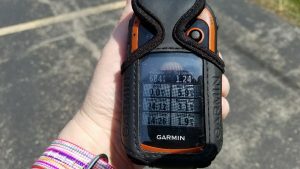 I’m going to be doing new GPS tests now that the connection issues seemed to have cleared up, so parts of the following review will need some updating. 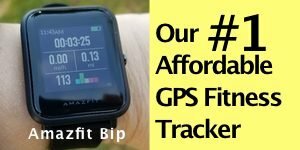 The Fitbit Versa uses connected GPS which means that it uses the GPS built into your phone so it’s difficult to determine distance accuracy because I don’t know how much the accuracy depends upon the Bluetooth connection or how good my GPS is in my phone. I was using the Samsung Galaxy S7 which I’ve tested quite a few times against several other fitness trackers and against the Garmin eTrex 20 and in all of those tests it was more accurate than what this particular test showed connected to the Versa. 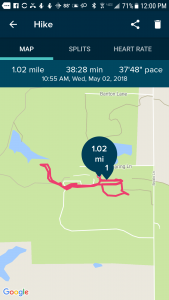 Looking at the map that displayed in the Fitbit app after the hike, the trail appears to be accurate as to where I actually walked but the distance estimate was less than what both the Garmin Fenix 5s (Current Price on Amazon: $480.59 and the Garmin eTrex 20 (Current Price on Amazon: $146.35) estimated. 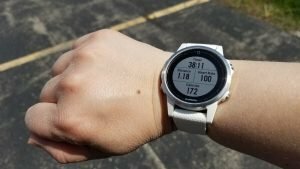 The Versa estimated I hiked 1.02 miles while the Fenix 5s estimated 1.18 and the eTrex 1.24. That’s a difference of a little over two-tenths of a mile. I’m going to assume that the eTrex would be the most accurate between the three. In other GPS tests I’ve done with the Versa it performed a little better than this one but I think connectivity issues affect GPS accuracy. In one of the tests, I noticed that the Versa was trying to connect again with my phone. It reconnected but these multiple disconnects and reconnects will throw off the connected GPS performance. 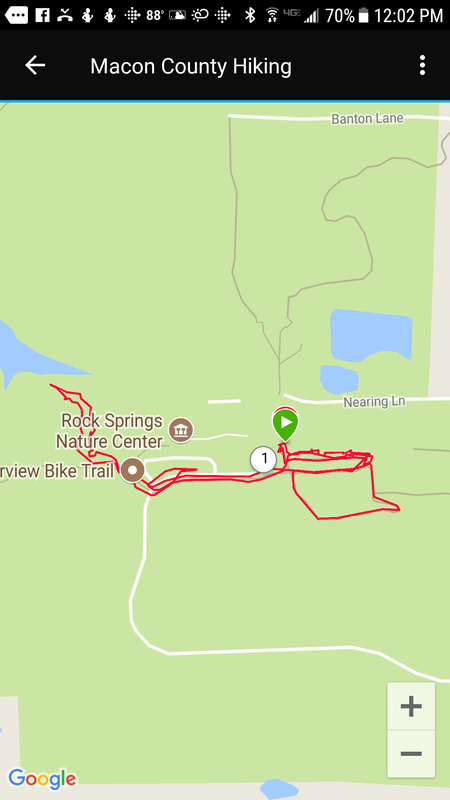 During the same hike, the Versa estimated my average heart rate at 103 and the Fenix 5s estimated my average heart rate at 106. 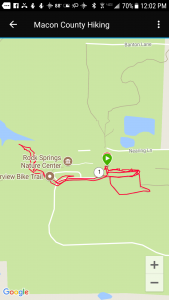 The results were very similar throughout the hike and this has been what I have experienced during other activities. 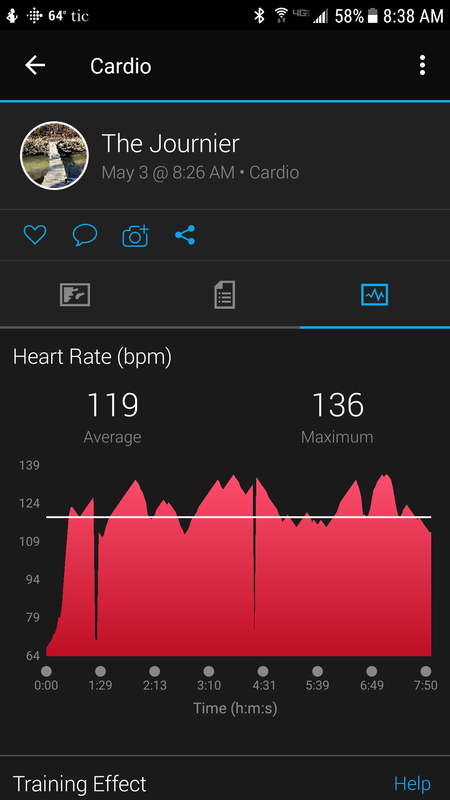 The heart rate sensor of the Versa has worked very well for me, even compared to a chest heart rate monitor which I’ll be discussing in a bit. And here are a couple tests of the heart rate sensor against the Wahoo TICKR, (Read Review | View on Amazon) a chest heart rate monitor paired with the Garmin Fenix 5s (View on Amazon). 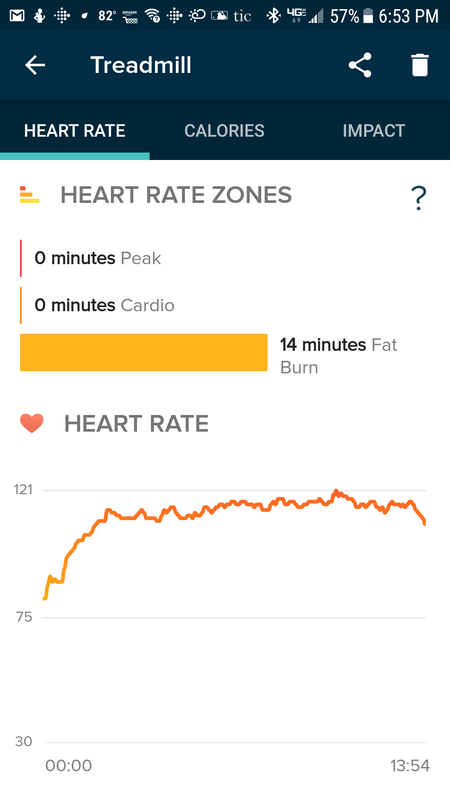 As you can see, the Versa did an excellent job against the chest HR strap for both the treadmill and elliptical machine. 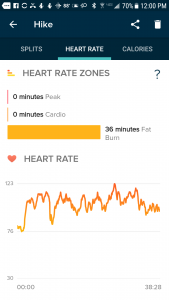 The Versa is probably the best wrist HR sensor I’ve tested for non-cardio workouts. 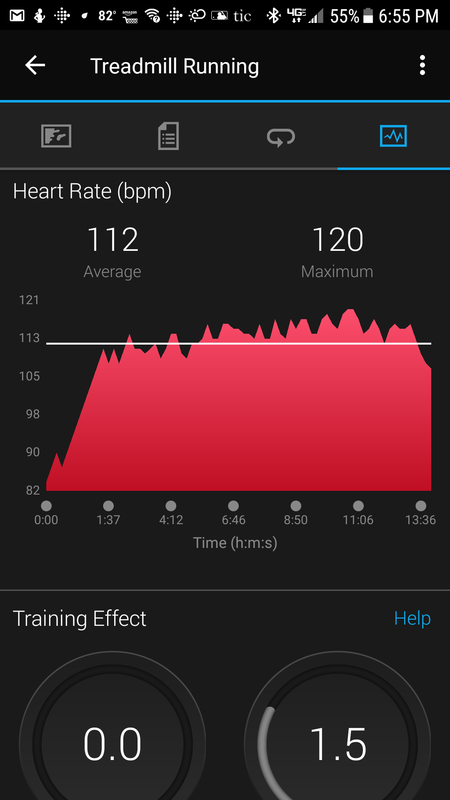 Usually, any activity that involves flexing the wrist like doing push-ups or planks push beyond the limits of what wrist HR sensors are capable of measuring but the Versa did a very good job as I followed along with the 7-minute guided workout on the watch. 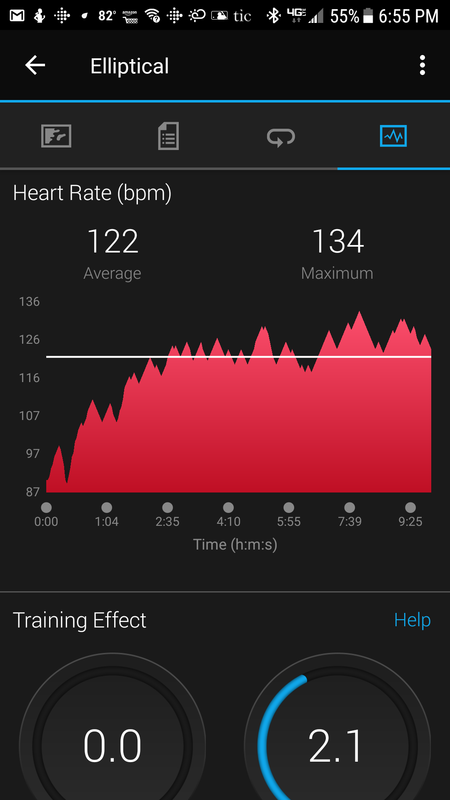 Of course, it struggled the most with the push-ups and planks but the overall average HR was identical to that of the chest heart rate monitor and most of the time the numbers were very close or the same. This is compared again against the Fenix 5s that was paired with the Wahoo TICKR. The Versa is equipped with three guided workouts and you’ll find them under Coach on the menu. These are exactly as the name implies, guided workouts. An example of how to do each exercise is shown on the screen as you go through each workout. 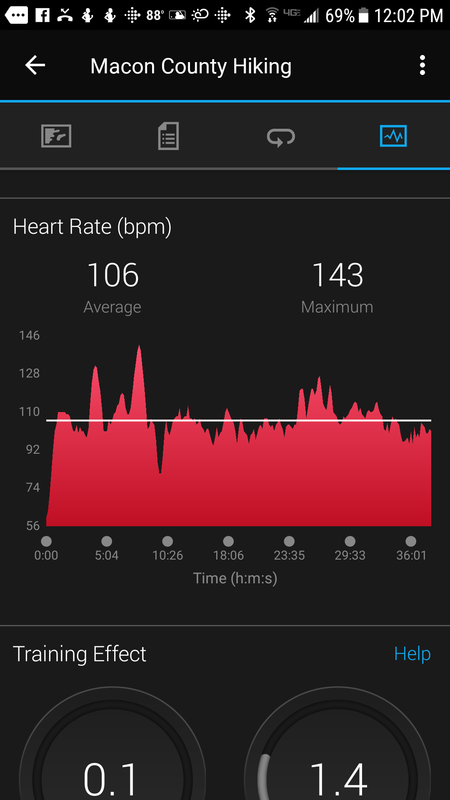 These workouts really get your heart pumping! If you haven’t worked out for a while, you’ll probably need to build up to doing these, even the 7-minute one. The only thing that was a bit annoying was that I couldn’t find a way to stop these workouts once I started them. 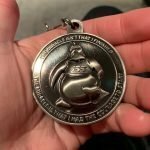 I had to let the guided workouts run all the way through even if I was through with them before they were through with me. Ha! As primarily a hiker and walker, the Treasure Chest workout kicked my behind! I’ll have to build up to that one. 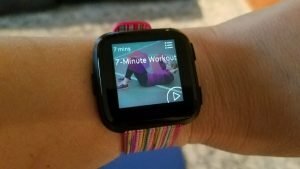 It would be nice to have more guided workouts to choose from or the ability to create custom workouts but if you can do all three of these without struggling, your physical fitness level is probably pretty darn good! 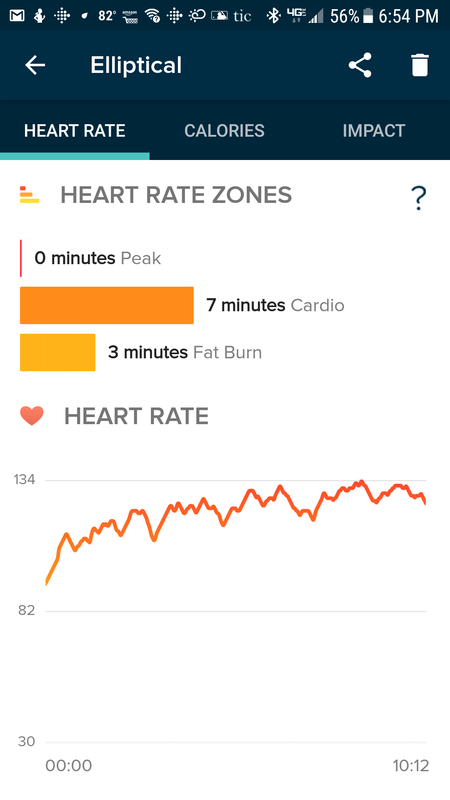 Normally, it’s been my experience with various Fitbit devices that they tend to be a bit overly generous with steps but the Versa didn’t behave that way for me. It did miss steps that I took inside my house but was very good during workouts or on longer walks. I didn’t notice it adding any steps when I was driving and believe me, the roads in Illinois are bumpy! If you have a job in which you take several short walks of less than 20-30 steps at a time, some of those steps will likely be missed. And of course, when I was pushing a shopping cart, it missed many of those steps as well. It would be nice to have the option to use different sensors to detect steps depending upon what type of activities you’re doing. 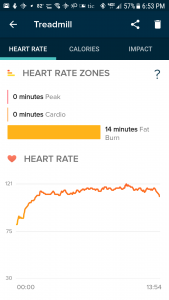 For example, my old Fitbit Zip that I wore on my belt picked up steps mainly from vibration while most fitness trackers today usually count steps by arm movements. It would be helpful to be able to choose which method to use but I don’t know if we’ll ever see that in a fitness tracker. The only way to count your steps when pushing a cart, stroller, or lawnmower, etc., would be to wear the Versa around your ankle but that isn’t too practical. 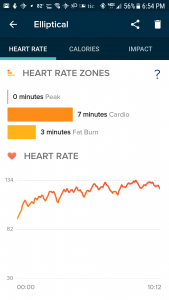 Still, overall I would grade the Versa high for step tracking. 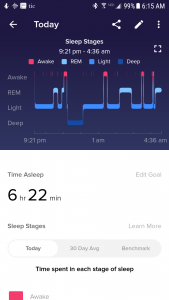 Fitbit has always been very good at sleep tracking in my experience. It’s usually accurate within 10-15 minutes or less for the total sleep time. 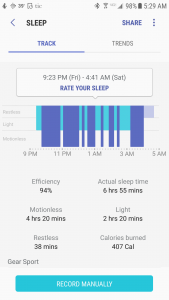 Below is the same night of sleep tracked by the P1 GPS Sportwatch (Read Review | View on Amazon) that I happened to be reviewing when I first got the Versa. 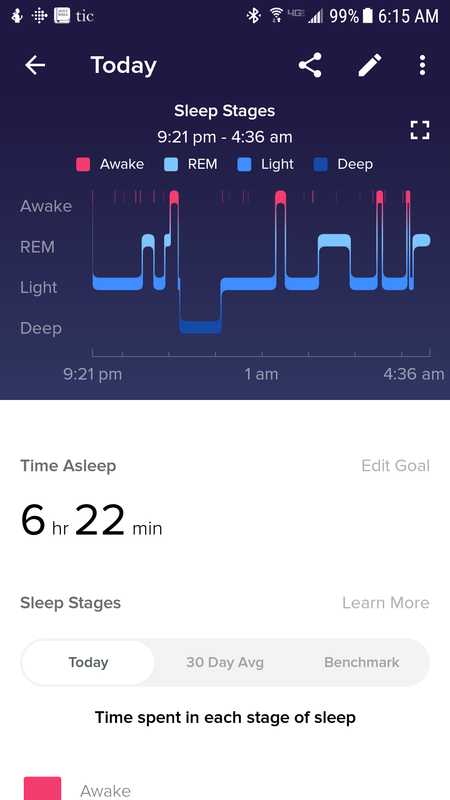 The P1 does a good job with sleep tracking and I actually think for this particular night, it did better the Versa but both did a good job, although the Versa seems to be a bit slow picking up when I actually woke up. I can be awake for 10-15 minutes before getting out of bed and it sometimes it doesn’t pick up that I was awake earlier. Instead it says I woke up when I actually started walking. Usually Fitbit is much better. Still, I like that it does distinguish between light sleep, deep sleep, and REM. The Versa gives the option of transferring music from your computer or using paid streaming music services. 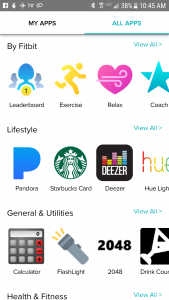 Pandora and Deezer are currently supported. I signed up for a free 30-day trial with Pandora to test it out. If I decided to keep the subscription it will cost $4.99/month which isn’t bad at all if you’re going to use the service a lot. Transferring music is done by Wi-Fi and it will only sync music when the watch is on its charging dock and Wi-Fi is set up through the Fibit app. If you transfer from your computer, you’ll need to connect the Versa by USB using its charging dock and then transfer the files by Wifi. You’ll also need to Fibit app for your computer. It would be great the files could be transfer through the USB instead of Wi-Fi. The process would be much faster. I discovered that most of the songs in my iTunes account wouldn’t transfer due to whatever issue (different file formats? 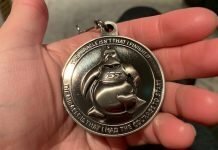 copyright reasons? idk), so I decided to just go with a streaming service so I wouldn’t be stuck listening to the same few songs over and over. It would be great if music could be transferred through the app from songs downloaded on your phone. This is how the Samsung Gear Sport works and that process is simple and quick. 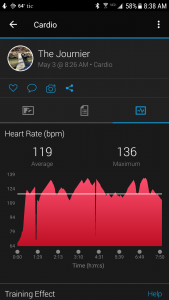 I’m not going to give this feature a grade since most fitness trackers don’t support music storage, although many are beginning to so I might add this to the list later. 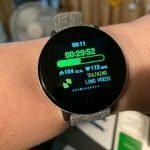 I try to grade each tracker using the same basic criteria (heart rate sensor, GPS, steps, connectivity, build quality, battery life). 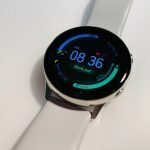 Of course where the Versa separates itself from other fitness trackers is that it is also aiming to be a true smartwatch. That’s a watch with an app store that can extend the functionality of the watch. As of right now the app store is quite limited. I didn’t find too many apps that I would find terribly useful in my daily life other than a weather app, Yelp!, a calculator, and an air quality app. One feature that I particularly like is Fitbit Labs and these are clock faces and games developed by Fitbit that are very motivating to encourage walking more. The clock face shown below is called Timmy. 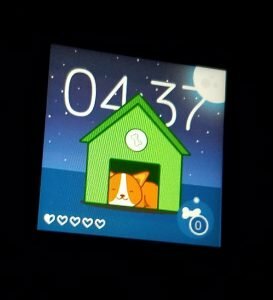 As long as you meet your step goal your virtual pet will by there with you, walking when you walk and sleeping when you sleep. There’s also a pirate game in which you can gain coins and unlock new features as you meet step goals. Fitbit Labs Timmy Clockface – The dog sleeps when I sleep! I think what is most missing from the app store are third-party fitness apps. It does have Strava but it only displays your past workouts done through the app. 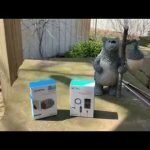 I’d rather see something similar to what the Samsung Gear Sport (Read Review | View on Amazon) has with MapMyRun and Endomondo. Another app that I would like to see is a good hiking and/or navigational program with a compass and breadcrumbing. 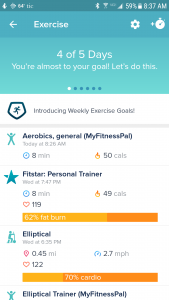 Hopefully, we’ll see more apps being developed and launched soon for Fitbit OS. The ability to respond to text notifications is supposed to be coming in May of 2018 for Android users and Fitibit is working with Apple and Windows to make replies possible for them as well but Apple typically doesn’t play well with other watches. Other features yet to be enabled are women’s health tracking and blood oxygen measurements. The Versa has a sensor built-in to measure blood oxygen but it isn’t enabled just yet. This may make detecting sleep apnea a possibility. I thought I’d add this section in because there are features that I like about Fibit that I think are very useful for people. 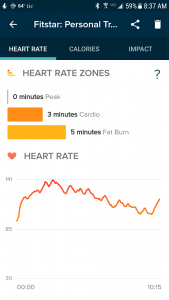 One of those things that I really like is the cardio score that Fibit provides. This is a useful number to go by to help people know where they are along the spectrum. 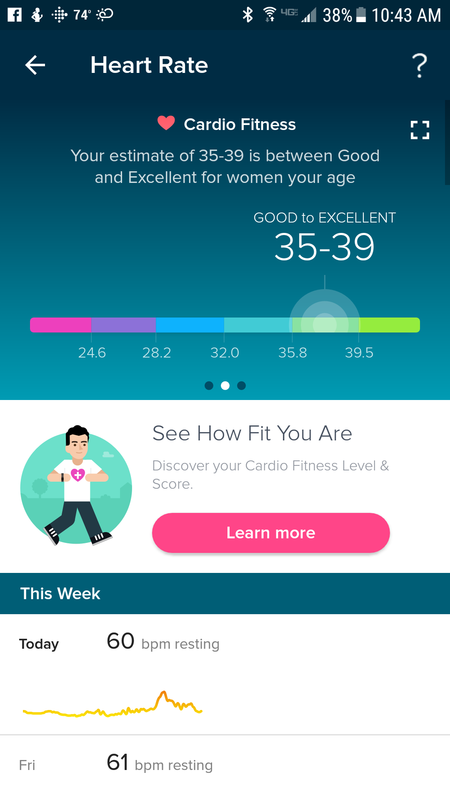 It’s not to be substituted for a medical diagnosis but I think it’s important for people to know how their physical activity and weight affects their cardio score. 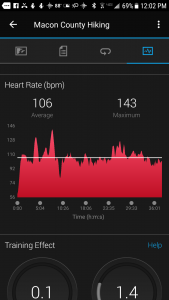 Your resting heart rate is a very important consideration. Having a fitness tracker and keeping an eye on your resting heart rate can indicate when your physical fitness is improving and when something is off. 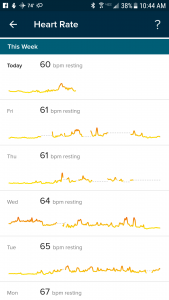 For example, I was sick for about 8-9 days and that is reflected in my resting heart rate. 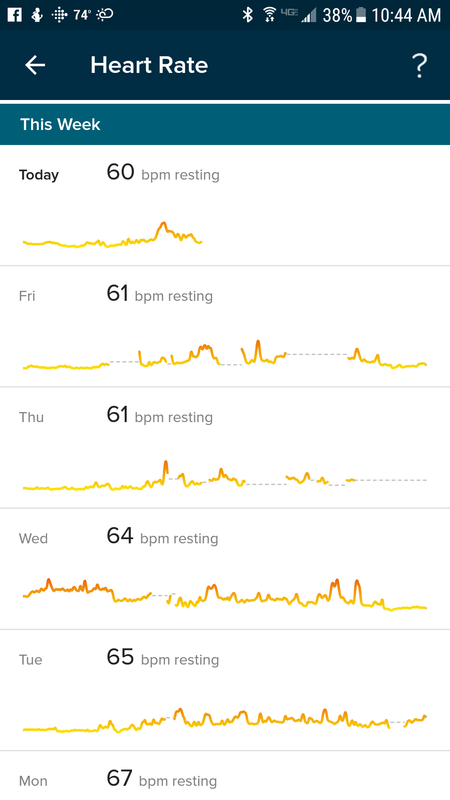 You can see from the records below as my health improved, so did my resting heart rate. 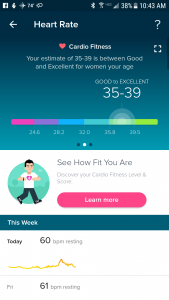 I mention this because the natural evolution of fitness trackers is to go more into the medical side of things and help patients and doctors monitor and detect changes. Being able to detect sleep apnea, atrial fibrillation, and possibly other health conditions sooner will save lives. I think the technology is already good enough and getting better every year but once fitness tracker cross over into the medical realm then there’s FDA approval to deal with. Plus, they have to be pretty darn accurate or it’s going to be lawsuit city. And I think that’s the hold up. The technology is there but unfortunately so are the lawyers! 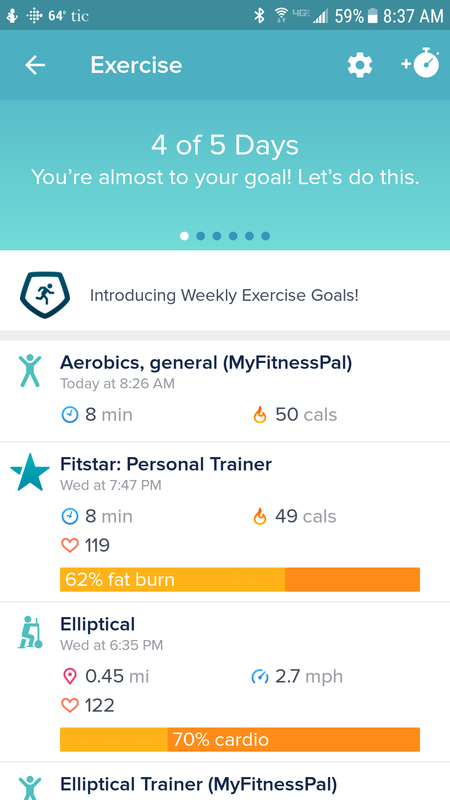 Fitbit is wanting to add those features. The Versa (and Ionic) does have a blood oxygen sensor built in but FDA approval is probably needed before it can be used. 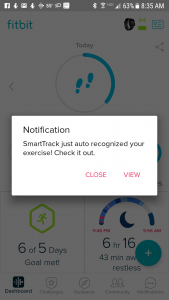 Another features I like about Fibit is its SmartTrack auto recognition of activities. Other trackers have this but Fibit seems to do it better than anyone else. It’s motivating to me to know that I’m be credited for the more intense physical activity I do throughout the day. It makes me want to be more physically active and for longer periods of time. 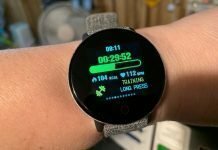 Overall, the Versa is a solid fitness tracker but it is plagued by persistent connectivity issues that are aggravating to “fix” because there doesn’t seem to be any one fix that solves the issues. At times I thought I had syncing issues fixed but then for some unknown reason, the Versa would stop syncing again. When everything is working fine the watch is a pleasure to wear but when it becomes disconnected again, it’s certainly no pleasure. The Versa is very lightweight and comfortable to wear. You’ll be able to find plenty of watch straps for it and I haven’t found changing the straps to be a terrible experience. Yes, other watches with quick release straps are easier to change but once you get the hang of it, it’s not so bad. The screen is very readable in sunlight and color reproduction is very good. I’ll be getting a screen protector for it because it is a larger screen that could easily be banged against something. I have accidentally hit the screen a few times against various objects and I haven’t noticed any scratches though. I would have preferred that the watch had been a little less wide because when I’m flexing my wrist during workouts it sometimes gets in the way. 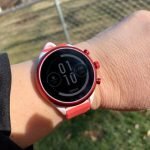 The size of the Amazfit Bip (Read review)is the perfect size for my wrist. Still, I think the Versa looks good on any size wrist and functions well. The Versa is supposed to get 4+ days of battery life and for me it’s probably closer to 3 days but that’s still good for a smartwatch/fitness tracker. I’m happy with the battery life considering my Wear OS smartwatch only gets about 1.5 days between charges. 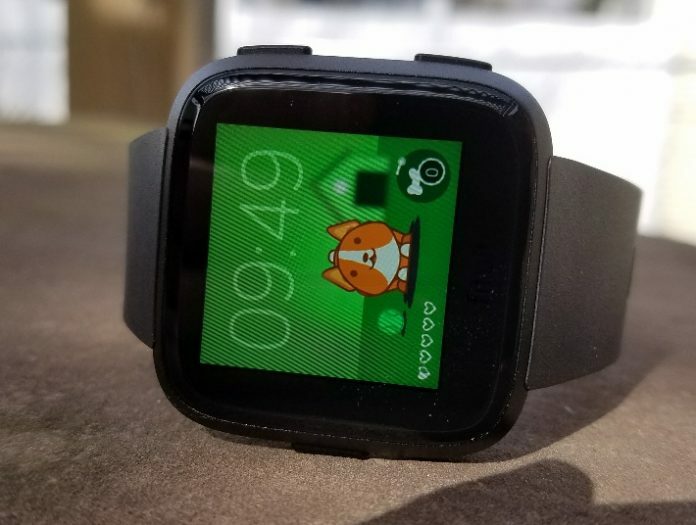 The Fitbit Versa made me excited about Fibit again and thought it doesn’t have my dream wish list of features yet like a built-in GPS and mic/speaker, it’s still become my favorite daily watch. I’m interested to see what the Versa will be 3, 6, and 12 months from now as new apps are developed, and I think we’ll see many more apps coming since it appears the Versa is selling quite well. Those third-party apps could give me what I’m still wanting, like navigational features with a great map app, compass, and breadcrumbing, especially for my hiking adventures. So, after a rocky start with the Versa, I can feel fairly confident now in recommending it. I think it’s just going to keep getting better. The Fitbit Versa is a capable fitness tracker but suffers from connectivity issues that will hopefully be worked out soon. There's a lot to like about the watch including its looks, size, weight, and screen. I may raise some of the ratings over time if those syncing issues are worked out and as new apps and features are added. The Versa has a lot of potential but it's still a work in progress. I'm eager to see what the Versa will be 6 month to a year from now.